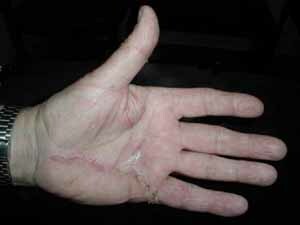 Dupuytren's disease is a condition that affects the palm of the hand, forming contracted cords, shown in the illustration above. It is more common in men and found most commonly in people with a Celtic genetic background (Irish, Scottish, Scandinavian, Northern European), although it is found in people of many different ancestries. It affects the connective tissue in the palm known as palmar fascia (normal tissues are shown in the illustration at the right), which is the tissue that helps stabilize the palm skin. The palmar fascia starts near the wrist, divides into pre-tendinous bands as it goes to the fingers, and then splits into two bands that attach to the natatory ligament and into the sides of the fingers. For a more detailed description, click here. Dupuytren’s contracture is a fairly common condition that occurs when the connective tissue under the skin (specifically, the pre-tendinous bands of the palmar fascia) begins to thicken and shorten. As the tissue tightens, it may pull the fingers down towards the palm of the hand. In some individuals, the condition may progress until the involved fingers become disabled. There is a strong genetic component to Dupuytren’s contracture, and people of northern European descent have the highest incidence. For instance, Scandinavia, England, Scotland, Wales, and Ireland have a very high incidence. However, Dupuytren's can be found in patients with other genetic backgrounds. The incidence of Dupuytren’s contracture is about seven times higher among men than among women. Most of the time, Dupuytren’s contracture doesn’t show up until after age 40. However, a very aggressive form may rarely appear in teenagers and children. Diabetics and people taking anticonvulsant drugs for epilepsy. The first sign is a tightening of the skin of the palm when the fingers are fully extended. The tissue over the pretendinous bands, especially at the distal plamar crease, is indented. The fat between them is forced up into slight swellings. This tissue is called the palmar monticuli, or little mountains of the palm. The next sign that develops is a thickening (nodule) in the palm of the hand that most frequently develops near the base of the ring or little finger. The nodule, which can resemble a callus, is painless but may be tender to the touch. 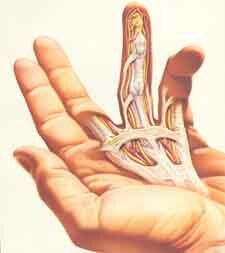 Gradually, a thickened tissue of palmar fascia forms from the pre-tendinous band and becomes a cord. This may extend across a joint, causing a contracture as the cord shortens. The overlying skin begins to pucker, and rough cords of tissue extend into the finger. As the process continues, these cords tighten and pull the finger in toward the palm. The ring finger is usually affected first, followed by the little, long and index fingers. The problem is not pain, but the restriction of motion and the deformity it causes. Some patients, particularly before any palmar signs develop, can develop rubbery masses over the dorsal aspect of the PIP joints. These are called Garrod's nodules. The progress of the disease is often sporadic and unpredictable. Exactly what triggers the formation of nodules and cords is unknown. As the disease progresses, the diseased tissue wraps itself around and between normal tissue. Many people do not seek medical care until the contracture is well advanced. The only treatment for this condition is surgery, which is usually reserved for individuals who have developed deformity as a result of the progressive contracture. Because many nodules do not progress to contracture and because scar tissue from previous surgeries can make excision of recurrent nodules more difficult, surgical removal of isolated nodules is not indicated in most cases. A good guideline for determining when to consider surgery is the "table top test." Try to place the palm of your hand completely flat on a hard surface. If you can’t, the contracture has progressed to a point where surgical intervention could be helpful. It is important to realize that there is no "cure" for Dupuytren's. Just like grey hair and wrinkles, there is only management. The main management option is surgery, although there are other options which have come on the horizon, needle aponeurotomy and injections of bacterial collagenase. Read the section below. The indication for surgery is to restore function to the hand. Several different surgical techniques can be used to remove the thickened fascia and correct the contracture. I feel that the traditional technique, called open fasciectomy, is tried and true and gives great results. There are several other techniques: the McCash "open palm" technique, needle aponeurotomy, and injection of bacterial collagenase. The aim of the surgery is to release the contracture and improve hand function by removing the diseased tissue. It is very important that the patient understand what to expect. Surgery does not "cure" the disease. The results of surgery are usually good, and the fingers can return to near normal extension after therapy, unless they have been flexed into the palm for many months. However, the disease usually will "return" some years after the initial surgery (see section below on Recurrence.). Dupuytren’s contracture usually does not recur beneath a skin graft, so this may be an option in especially aggressive forms of the disease. It’s important to keep the appointment with hand therapy after surgery (I will give you a prescription for hand therapy before surgery, and you are to make the appointment for five days after surgery. Be sure to call PRIOR to surgery!) You will probably have to wear a splint so that the fingers stay extended. The splint is usually worn full time immediately after the surgery and then only at night for several months. You will also have to do some active range-of-motion exercises so that the finger retains mobility and strength. Dupuytren's flare refers to a condition that occurs in some patients in which the hand has a lot of swelling, redness, stiffness of the joints, and sometimes pain. The hand has some resemblance to RSD, but in fact it is a different phenomenon. The cause of the flare is not known, but we have some idea. Surgical scars heal by the body laying down collagen (scar is just collagen), and Dupuytren's patients have a genetic abnormality in their collagen. It is hard to determine how many patients get it, but low-grade flare might occur in 20% and high-grade flare might occur in <5% of patients. Patients can get just a little bit of redness, swelling, and stiffness, and it is treated with a bit more therapy. They can also have a lot of the redness, swelling, stiffness, and some pain, and need a lot more therapy. The recovery from the surgery and the ultimate success of the surgery can be compromised by the flare reaction. In the worst cases, patients may have more limited range of motion and more scarring than they did prior to surgeries, but this is rather rare. This is the incision of a Duputyren's patient about two weeks after surgery on the palm and fifthfinger. Note how he can fully straighten out the finger. Many patients ask about return to work activities after a Dupuytren's release. Everyone is different, but here are some guidelines. Many patients want to return to golf. I asked one veteran patient (three releases over 20 years), who replied, "Hell, I went back to golf after a week. A bit tender, but I played." Others find that they cannot hold a driver securely for two months. I think that you will be able to dress and feed yourself the next day, general light activities will be returning over a period of one to four weeks, and recreational activities from one week to several months, depending on the activity. One patient told me he could play classical guitar for 15 minutes 2 weeks after surgery and for 60 minutes 3 weeks after surgery; he could ride his bike one month after surgery for about 15 minutes the first try and 60 minutes over the next couple of days. These are only rough guidelines, but gives you some idea of what to expect. Duputyren's disease is due to a genetic trait that comes from your parents that becomes expressed as we age. Every cell in your body has the same parents, so each cell has the Duputyren's DNA. The contracted tissue (the cord) will not come back, because it is surgically excised. But some of the adjacent tissues, since they have the genetic trait, may become involved with time as the patient ages, but we never know which tissues will become involved. It is more common than not for the Duputyren's contractures to occur in adjacent tissues, often between 5 and 10 years after initial surgery. These tissues were not involved at the time of the intial surgery, so it would have been impossible to know they were going to become involved, and therefore they are not removed initially. If they become involved, they may need removal. This process, where previously uninvolved tissues become involved is called "extension." So, Duputyren's disease does not "recur", in a technical sense, because the cords were removed; from a patient's point of view it does "recur", but it is really extension. If the Duputryen's occurs, it should be treated based on the criteria listed above. Don't wait until the joints are contracted, as then it is too late. The patient in the photo at right had a resection of the Duputyren's tissue about 10 years previously, but waited until the PIP joint was contracted 90 degrees. This finger now has a fixed contracture of the joint as well as of the Duputyren's tissue, and will not be able to be fully straight after surgery. For more information from patients who have had a Dupuytren's release by me and have written about it, click here. For another review of the same topic, see the site of my friend, Dr. Charles Eaton, an excellent Orthopedic Hand Surgeon in Florida: Dupuytren's Disease . Once you go to this page, select "Alphabetical List" and then select "Dupuytren's Disease."